The Bolle Tactical safety glasses are not only tested and certified for all applicable code compliance, they are also extremely comfortable and offer superior optical quality. Browse through the different styles below, from the Bolle SWAT safety sunglasses to the full eye shield X1000, and pick the Bolle model that's a perfect fit for your work environment. 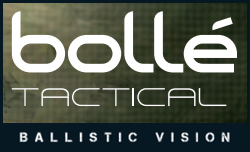 Bolle Tactical Safety Glasses and Safety Goggles are designed, tested and certified to Ballistic Resistance Standard GL-PD 10-12, MIL-PRF-31013 and ANSI Z87.1-2015.